Due to a combination of the earlier start with music in the shop, and massive increase in the number of titles available this year, we have decided to open an hour earlier than previous years! This should allow for a slightly less chaotic situation for customers and performers alike. At this point the weather forecast calls for a chance of rain. If it does start raining, we will do our best to open even earlier. Saturday April 20th, 2013 is Record Store Day! Like every year, we are celebrating it in a big way. This year there are more releases than ever, and we’re bringing a mountain of them in (at the moment over 330 titles are on order). Take a look at the list posted below. Due to the limited nature of these titles, it is not guaranteed that all the titles on the list will arrive, but cross your fingers! If there is anything that you don’t see on the list, but want to see here on RSD, let us know via-email! No promises, but we can try to bring in what you want. Bands! 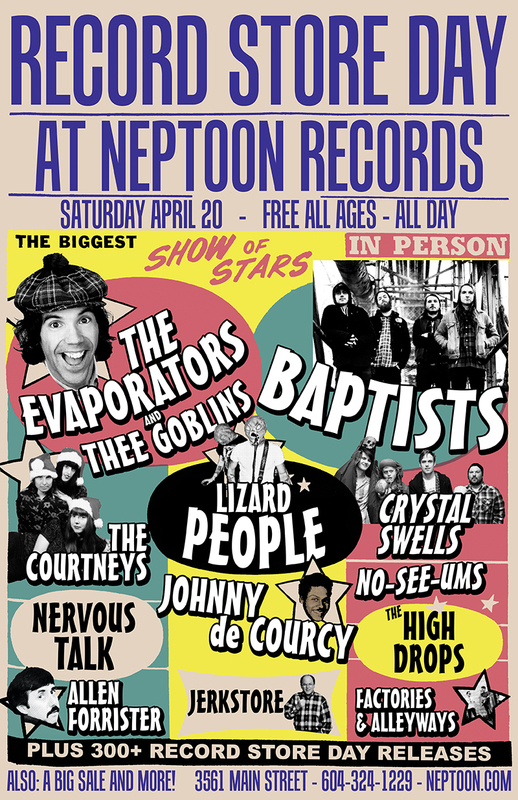 Here is the list of bands playing at the shop on RSD. As always, the show is free and all ages. *IMPORTANT UPDATE* Due to a work schedule conflict, High Drops will no longer be performing. Jerk Store’s set has been moved into their place to allow for a bit more breathing room around the noise by-law cut off time (8pm…..what ever happened to 11 hey?). RSVP to this on Facebook! Sale! As always, we will be having a sale at the shop on RSD. Check back soon for more info on that! Titles that are confirmed to arrive will be highlighted in bold italic. Most will not ship to us until right before RSD, so don’t panic if the title(s) you want aren’t confirmed yet! In some cases stuff doesn’t show up until the day before (talk about making us sweat). Items with a line through them have been cancelled and won’t be arriving to any stores for RSD. We will also be updating the list with items that we order (as there are always last minute releases, as well as things people request). *UPDATE from April 17th* Lots of titles WILL still be confirmed. Some we will not know 100% about until Friday. We HIGHLY recommend checking back on the site by 7pm on Friday for a final word on what will be here.